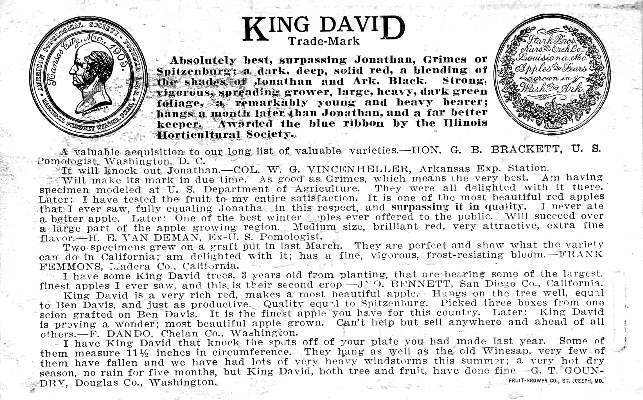 The above is an advertising postcard passed out by Grant Lightle for Stark Bros. Nursery’s King David variety, which after the turn of the century they were touting as one of their best apples. I happen to agree with them, as for beauty and flavor it seems to be tops from Maine to Mexico (that’s King David on the mast head of this blog). 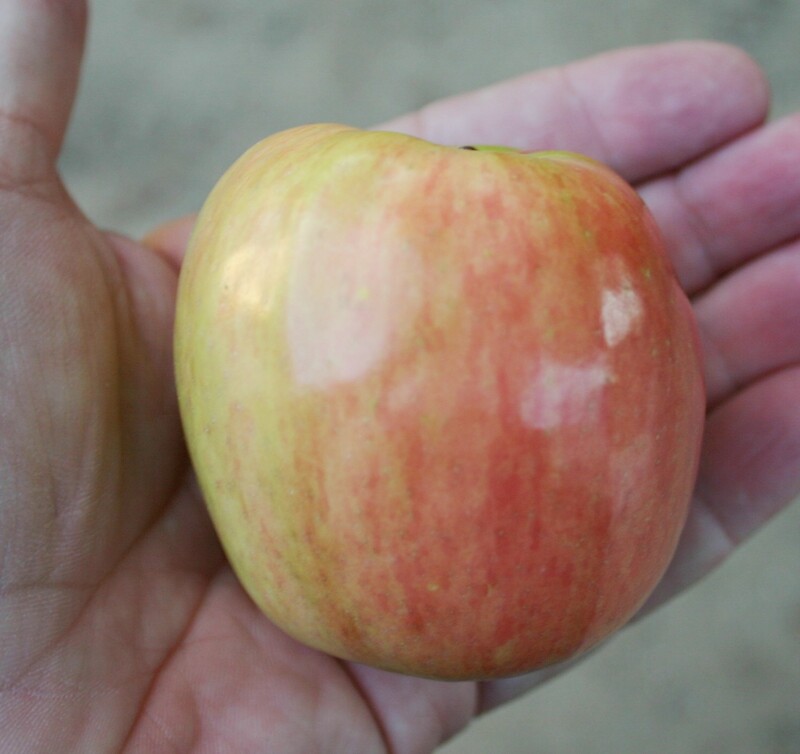 What is interesting is one of the quotes on the back from a satisfied customer: “I have some King David trees, 3 years old from planting, that are bearing some of the largest, finest apples I ever saw, and this is their second crop – JNO. Bennett, San Diego, California”. Were Mr. Bennett’s trees planted in San Diego? If so it is as balmy seaside climate as you could hope for, right next to Mexico and never getting much under 45 degrees or over 85 degrees. Now there are some mountains about 45 miles out of San Diego with a town called Julian that grows apples, but it is not convenient to San Diego (especially in 1910 with a population of maybe 600) and why didn’t they just say Julian? They list Madera, California on the postcard, and that’s not exactly a major city everyone is familiar with. It is entirely possible as King David does well for us here in Riverside, as it seems to do well whereever it’s planted. We’ll be doing more tropic testing on it in the coming years to see if we can truly extend it’s reign farther south. Good thing apple trees can’t read, or this Dixie Red Delight might discover that we only get 250 chilling hours and it isn’t supposed to be fruiting. Then it would probably tell Bramley Seedling that this isn’t England and it should quit fruiting for us also. Ignorance is bliss sometimes, but truth and reality are a lot more fun. The truth is the chilling hour needs of different apple varieties are not known and canot be speculated, and the only way to find out is to plant it somewhere warm and see what happens. Paragraphs like the one above are written by “experts” who are simply quoting other experts who quoted other experts, none of which have actually stuck the tree in the ground to see what happens. More often than not, the chilling requirement is much, much lower than anyone would have guessed. There may be other reasons not to grow it such as the fruit quality in the heat, but chilling hours should not automatically be one of them. It’s raining today, and rather cool. Here in arid Southern California rain is a big deal; we’ll have TV newscasters with the logo behind them STORMWATCH and a reporter will find some underpass that’s flooded with a clogged drain and some sap with a stalled out car in it. Then after the TV shoot a city maintenance worker will pull the debris off the grate and the water will drain out. Not that I want to make light of flooding; our unusual rains last fall washed out a main mountain artery that took months and millions of dollars to fix, hurting businesses in the mountains and making a nightmare commute for mountain residences. This may be irritating to those of you in wet climates, but I’m in awe of rain; here’s clean water that I don’t have to pay for. I just shut the drip irrigation off and it falls out of the sky, watering everything without spray heads or drip emitters or valves and manifolds- what a concept! It washes the dust out of the trees (yes, our apple trees get dusty here) and makes the ground soft enough to dig in. The last few years have been good rain years for us and outstanding snow years in the mountains, so I hope this trend continues this year; we’re off to a good start. At least it cut off a potentially devistating fire season. 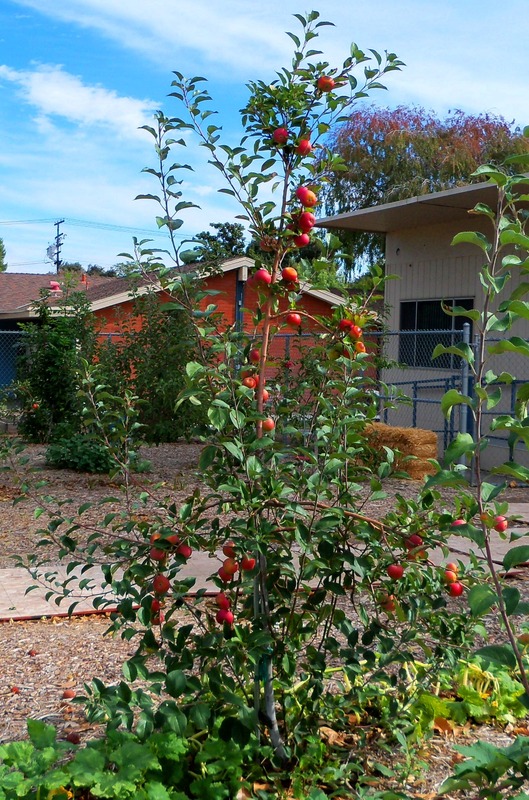 Because of limited space at my suburban yard, I nurture my apple habit by planting apple trees at local elementary schools. Of course they’re happy to oblidge, and kids are exposed to agriculture and botany in a developed area where farms are far between. I’m able to grow the trees out a bit bigger in these spaces and it has shown me that I can’t always judge a variety on how it does at my place. 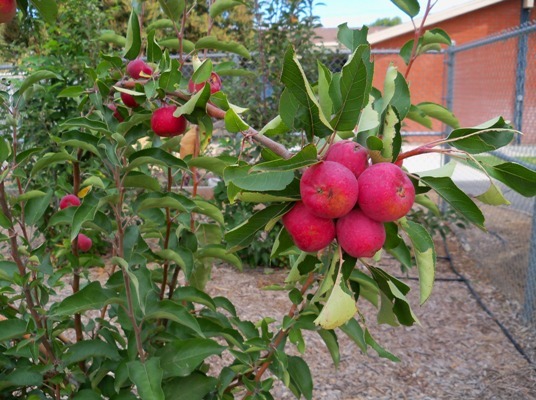 Varieties I’ve written off as being unsuitable have sometimes performed better at schools, whether it’s been from more vigorous trees, less competition, better soil conditions, or different lighting. This jewel above is Wickson, which is very good at my place, but here in full sun turns a bright, beautiful red, much more lovely than anything we saw in New England. This is not surprising as it was bred by Albert Etter in the foothills of the Sierra Nevada range, where the summers are very hot and dry. Apparently it needs this heat for best color and flavor. 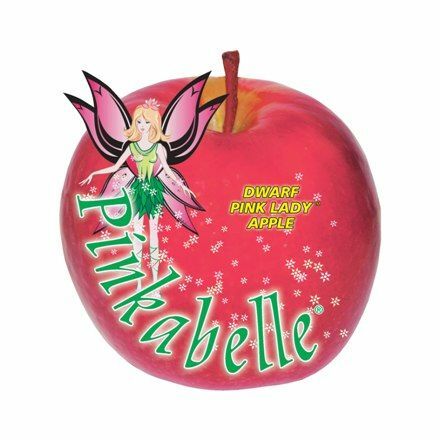 These are perfect kid-sized apples and the taste will sure make them easy to persuade the kids to eat them. 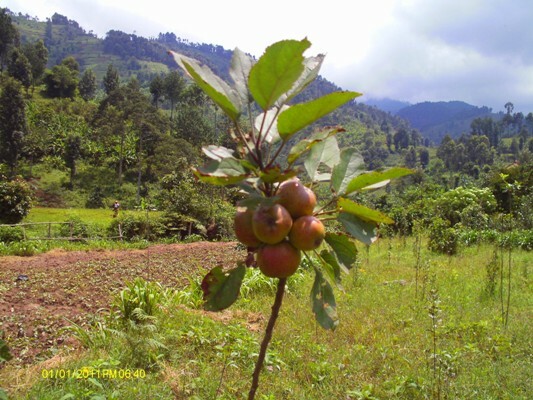 The intrepid Sharon from Apples for Africa just returned from the Lake Kivu region of Rwanda with this photo showing the orchard we sponsored a couple of years ago. They’re just stripping the leaves and whitewashing the trunks (to protect them from the hot African sun), getting ready for them to blossom again. The orchard looks healthy, with some training needed to tie the branches down horizontally to spur fruiting and enable them to hold a heavy crop load. Besides the orchard you can see it is an incredibly beautiful place; someone coming upon this orchard in the middle of the jungle must think they have arrived at a mystical land. 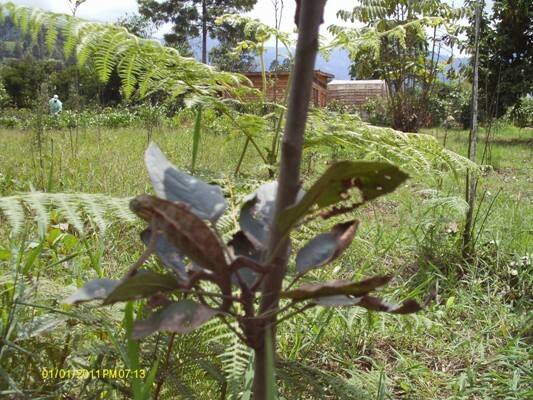 Where else do you have cameleons eating bugs off your apple trees? Well, it’s worse than I thought; turns out back in the ’70’s they were worried about climate change also. Make that the 1870’s. 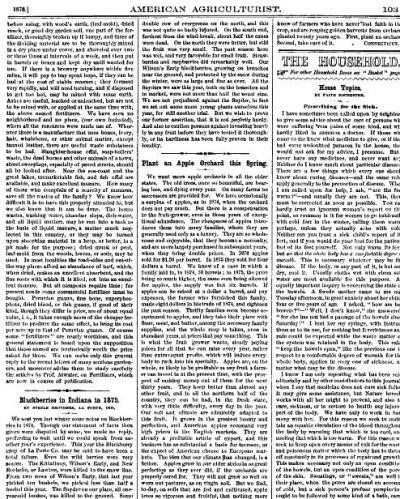 On page 101 of the January, 1876 issue of The American Agriculturist there’s an article encouraging people to plant an apple orchard, and apparently some were under the impression that the climate in the eastern U.S.A. was changing, and apples did not grow as well as before. To this the author states “The idea that our climate has changed, is a fiction. 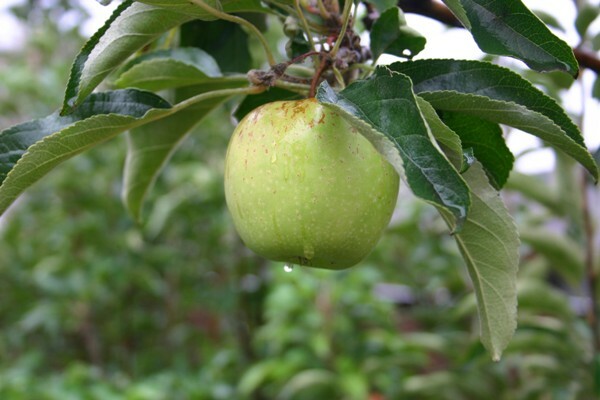 Apples grow in our older states in as great perfection as they ever did, if the orchards are properly cared for.” I don’t know if a spate of either colder or warmer weather caused this speculation, but it goes to show that the only constant is change. People have asked if I think the climate is changing, and if human activity is causing it. I really don’t know, nor am I that concerned; I’m convinced that the rapid decay of our culture will doom us much sooner than an eventual few degrees of climate change. Sin and godlessness is the ultimate in unsustainability. But cheer up, the solution is right at hand; “If My people who are called by My name will humble themselves and pray and seek My face, and turn from their wicked ways, then I will hear them from heaven and heal their land” (2 Chronicals 7:14). OK, the color isn’t that great; this is Cripp’s Pink, which when grown to the high standards (much higher than this sad example) set by the Pink Lady Growers Association can be marketed under the trademark name of Pink Lady™. The patent expired last year so I can propagate it under the cultivar name Cripp’s Pink, but I still can’t call it Pink Lady. Despite the lackluster color it was still scrumptios; crisp, juicy, sweet, appley. They even hold up well to the heat of Las Vegas, where it’s suceptibility to fire blight isn’t much of a problem in the hot, dry air. Down Under they’ve developed a naturally dwarfing strain that’s grown on it’s own roots marketed as Pinkabelle™ Don’t look for it anytime soon in the nursery, as it’s still undergoing testing in the USA and won’t be released for at least 5 years (I tried to be a tester, but never heard back). It’s causing quite a stir in its native Australia, especially with growers in warmer districts.